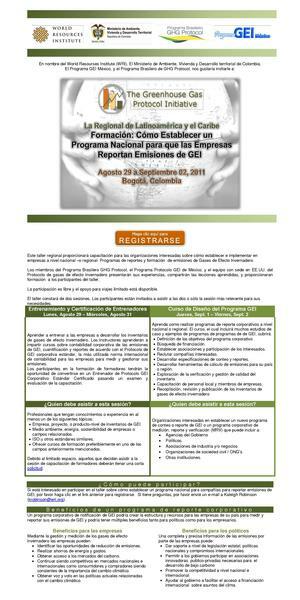 This regional workshop will provide training for interested organizations on how to establish and implement national- or regional-level corporate greenhouse gas (GHG) emissions reporting programs and trainings. Members of the Brazil GHG Protocol Program, the Mexico GHG Protocol Program, and the US-based team of the GHG Protocol will be presenting their experiences, sharing lessons learned, and providing training to workshop participants. Participation is free and limited travel support is available. The workshop will include two sessions. Participants are invited to attend both or only the session most relevant to their needs. 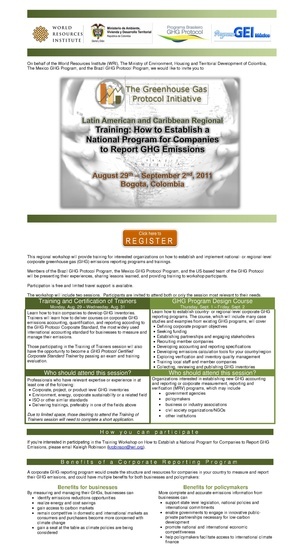 "This regional workshop will provide training for interested organizations on how to establish and implement national- or regional-level corporate greenhouse gas (GHG) emissions reporting programs and trainings. Members of the Brazil GHG Protocol Program, the Mexico GHG Protocol Program, and the US-based team of the GHG Protocol will be presenting their experiences, sharing lessons learned, and providing training to workshop participants. Participation is free and limited travel support is available. The workshop will include two sessions. Participants are invited to attend both or only the session most relevant to their needs. [[File:Invitación-Español.pdf|thumb|left|Spanish" cannot be used as a page name in this wiki. This page was last modified on 26 July 2011, at 10:01.